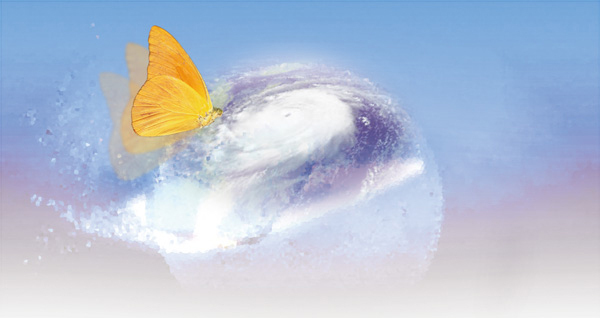 God's Direct contact/Feature Reports/Spirituality and Science/The "Butterfly Effect"
In 1972, American meteorologist Edward Lorenz presented his findings of a decade-long research in his speech and paper entitled “Predictability: Does the Flap of a Butterfly's Wings in Brazil Set off a Tornado in Texas?” at a meeting of the American Association for the Advancement of Science in Washington, D.C. He described how certain systems show strong sensitive dependence on initial conditions, and how small variations in the initial conditions of a dynamic system could produce enormous changes in the long-term outcome. He named this phenomenon the “Butterfly Effect,” based on the fact that the flapping of a butterfly's wings could create a disturbance in the surrounding atmosphere and generate a feeble current. This feeble air current could set off corresponding changes in the atmosphere or other systems in the environment, and this chain reaction could eventually lead to drastic changes in the other systems. Lorenz pointed out that every flap of a butterfly's wings and every human action would be reflected in the global weather. From the spiritual perspective, the Butterfly Effect signifies the importance of thoughts and the inter-relationship between action, speech and thoughts. It points to the universal law that “all are one.” Although scientists have yet to truly understand the spiritual power functioning behind this world, they have gone beyond their past practice of embracing only scientific theories and realized that everything is interrelated. This shows that they have risen to a higher level of spiritual consciousness from which they now view the world we live in.